Did you see a resonance of support for your publication during National Newspaper Week? We hope you'll keep the conversation going about the importance of newspapers with these small space filler ads that support our Newspapers Matter campaign. 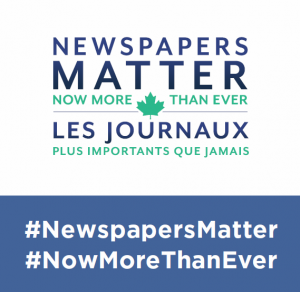 You can download a selection of small space ads that you can use in your paper to encourage your readers to support newspapers by joining the list of supporters across Canada at www.newspapersmatter.ca.